I do enjoy catching perch. Big ones, small ones, it makes little difference I think they are superb little fish. Last week I set out specifically to catch some on livebaits. 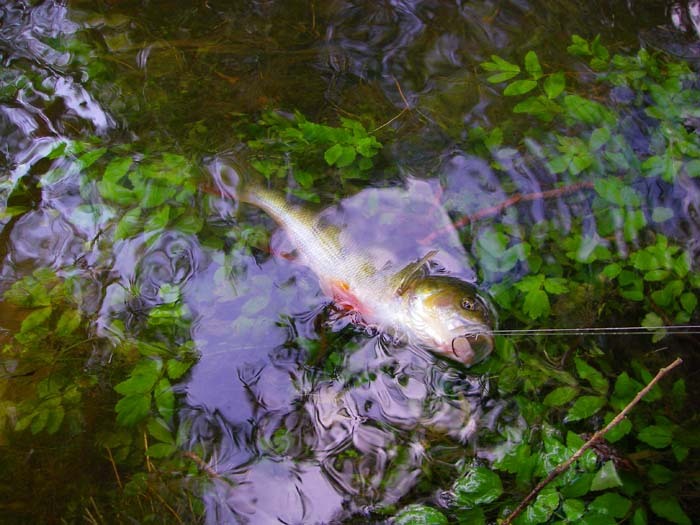 I took the perch rod plus a small spinning rod armed with light float tackle. 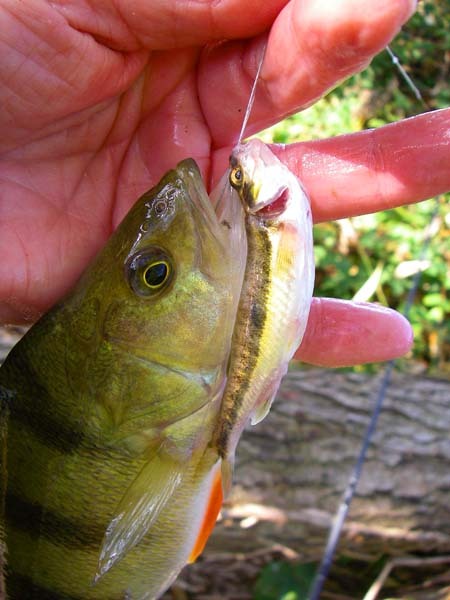 By baiting up with a single maggot it is usually possible to catch, more or less, a minnow every chuck. Sure enough I soon had a dozen minnows in my little bucket and, without shifting my stance, I baited the circle hook with a minnow and lowered it in to slightly deeper water. Within seconds I felt the tell tale bump bump as a perch mouthed the bait. Gently tighten the line and the kicking pull of a perch told me that I had a customer. The fish was well hooked on the debarbed circle hook so I took its picture and put it back. Over the course of an hour or so I tried several spots and every one produced perch. The biggest fish might have been only a pound or so but I really enjoyed the session. Eventually I tired of the small perch and changed to a plug, a J11, in hopes of a bigger one. Third cast I felt a tug but nothing came of it. I moved upstream casting every few yards but no more bites so I decided to work my way back down. Every couple of paces I cast down and across and let the lure swing across the current to my bank before retrieving. Eventually, just at the point where I'd missed a bite, there was a fierce take and I found myself playing a pike. It wasn't a big fish but needless to say it fought much harder than any of the perch that I'd caught. 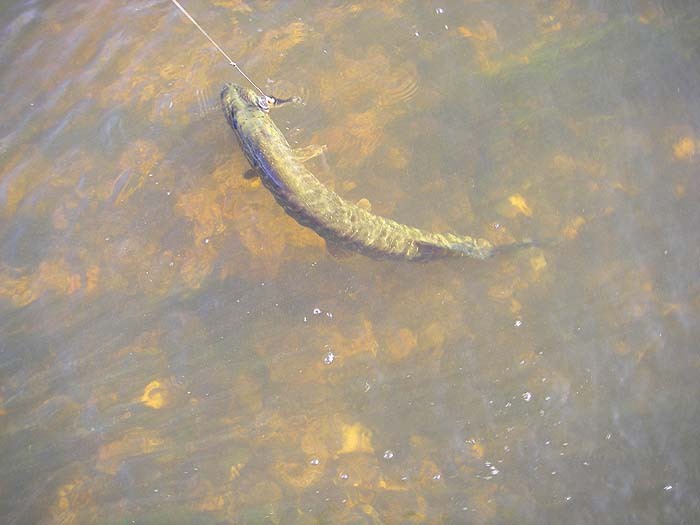 After releasing the pike I went home but it was a very enjoyable afternoon.